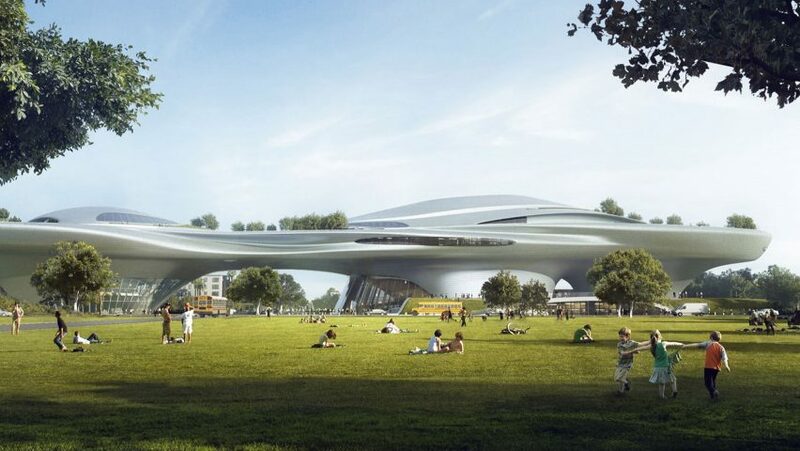 The museum proposed by filmmaker George Lucas could finally come to fruition now Los Angeles city officials have given it the go-ahead. The Lucas Museum of Narrative Art received unanimous approval from LA's City Council on Tuesday, after years of struggling to find a home. "It's going to be a slam dunk," said mayor Eric Garcetti ahead of the decision. Proposals for a futuristic building by Beijing studio MAD were first put forward for Chicago in 2014, but eventually blocked by local opposition groups. San Francisco was also considered as a potential location, before the museum's board settled on LA in January 2017. The site is in the city's Exposition Park, close to the Natural History Museum, Science Center and Coliseum. Parking lots and a soccer field, which will be moved and upgraded, will make way for the building. The latest iteration of MAD's design is a $400 million (£308 million) five-storey structure with a sinuous form. Huge arches will allow the public to walk underneath, while rooftop terraces will provide additional green space. Garcetti described it as "one of the boldest pieces of architecture we've seen in the world." "[It's] an incredible institution that will inspire generations to come," he added. Inside, the museum will contain around 100,000 square feet (9,000 square metres) of galleries showcasing Lucas and wife Mellody Hobson's personal art collection, as well as memorabilia from Star Wars and other movies. "This is not a vanity project," said Hobson. "This is something that will serve society well for years to come." Catering and educational facilities will also be included, while underground parking will accommodate 2,425 cars. Many officials backed the decision to bring the museum to LA earlier this year, hoping that the project would re-enliven the area of the city, bring in jobs and attract tourists. Groundbreaking is now set for early 2018, with the grand opening currently expected in 2021. Also moving forward in the city is Peter Zumthor's overhaul of the Los Angeles County Museum of Art, plans for which were last updated in April 2017.